There are a million ways to go with sunglasses, from dark, partial wraparounds that say "behind these lenses is a man who'll stop at nothing until he achieves cold justice", to colorful shutter shades that say "behind these not-lenses is a guy watching television in his living room". 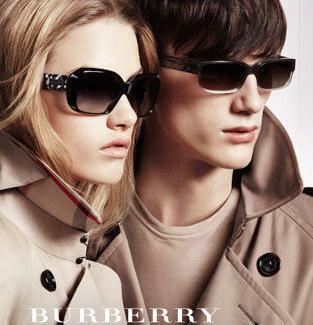 For a more iconic look, check out the Burberry Spring/Summer 2010 Collection. Referencing both the distinguished Burberry archive and this season's collections, the latest Burberry eyewear drop brings together decades of tradition and innovation into styles so distinctly British, strangers will randomly offer you scones. And hopefully, phone numbers. The latest includes acetate rectangular shades with a graphic trademark Burberry check printed on the temple -- so you'll look dignified even driving 100mph -- and, in light acetate, a new rounded aviator style that'll look dignified even flying at Mach 1, or at least navigating, which is also a very important job. Colors include neutral tones of trench, tortoise, grey and black, mirroring the sombre palette of the men's ready-to-wear collections, because style's not all about flashiness unless you make your living nailing triple axels. New women's offerings include a square take on the men's rectangular, and rounded oversized models with accessories-inspired hardware – a reminder that Mother's Day is coming up, and every day is Girlfriend Day, so best get up off that couch and buy them something.